We know you’ve been dying to get to know who’s behind both the sales and technological wizardry here at Secure Sense, so here you have it, the Crew Interview. Today kicks off our very first of a mini blog series about getting to know who runs the show, a.k.a. 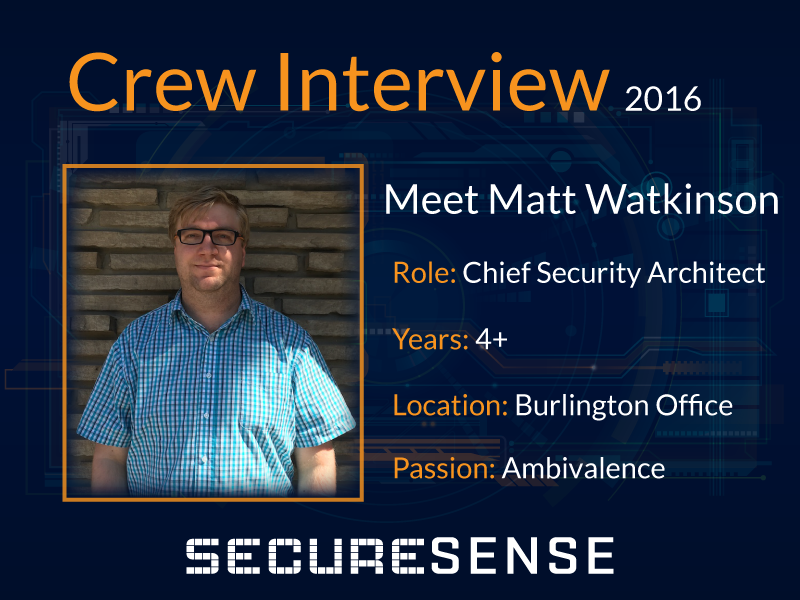 our Secure Sense Squad…ahem…first off we have, Matt Watkinson! Ok, first one’s easy, Coffee or Tea? Coffee generally, but ill drink tea. I have a pretty substantial Tea drawer at home. I am a definite fan of Maté. Could you tell the lovely people of the world wide web exactly what you do here? Keeping abreast of information in the security sphere to ensure customers are aware of important breaking news in the industry. Act as Subject Matter Expert on a handful of products that I have worked with closely in the past. How did you get into the tech realm? Fell into it backwards. In college I worked with a couple of Linux servers as part of a project. It turned out that managing Linux servers for some individuals paid the bills. A few years later on when I was Laid off from a career position, I ended up getting a job programming debit/credit terminals, and moved into system administration from there. What is your technological super power? Being able to mentally take something apart and understand how it works through reading documentation is sort of what got me to where I am today. Being able to take stuff apart is a fantastic skill, and definitely not to be overlooked. It is a skill that belongs to the Troubleshooting skillset. A lot of the time all you have to work with is some basic equipment documentation, or some RFCs that have been published that you have to leverage to get a deeper understanding on how to take something apart further, or understand why something isn’t behaving the way you expect it to. It applies to hardware, software, or even protocol analysis, anything where you have to get your hands dirty in low-level debugging. What has had the most significant tech change since you’ve started in this industry? The attitude around the corporate embrace of security, without question, is the biggest and most significant change I’ve seen. Cloud services, in the “there is no cloud, it’s just someone else’s computer” has always existed in some way or another. Shared web servers, managed mainframes, managed backup systems, managed PBX solutions, etc. are all a part of that mindset of at the very least out-sourcing skillset, if not hardware. The true corporate embrace of security seems to be a relatively new concept. Some business sectors such as the financial sector, have been more cognizant of security, at least in specific areas, however even then the business as a whole did not embrace the idea. There were large sections of the environment, where security was an afterthought. Now we see even many SMBs starting to ask about how they can secure their infrastructure. Businesses are starting to embrace that security is all about a series of processes which govern their activity, not a series of products or technologies that you have to deploy to be “secure”. In your opinion, what is the biggest technological threat to companies, and what advice can you offer readers? Cloud, not necessarily the use of “the cloud” but the misunderstanding of the risks, rewards, and overall concept of what the cloud really is. When you trust your data with “the cloud” you are trusting that data with a 3rd party may not have your best interests in mind. Given my preference, at least in concept, I like things being in-house, but in practice, this is really hard. This makes me sound very anti-cloud, and I am not. You can’t just weigh the bad of the cloud, such as your data being just at arm’s reach, and ignore the good, the value proposition, of the cloud. It would be foolish and ignorant of me to discount the cloud as a technology, when there seems to be so many businesses pushing data in that direction. I just feel that a lot of organizations that I have worked with seem to have an “all or nothing” approach to cloud, and I feel that this approach is rarely if ever correct for that business. What is your favourite part about working at Secure Sense? I love coming here, it’s a fun and friendly place to work. It is always interesting to come in to work to see what new vulnerability or exploit we have to deal with. Reproducing those vulnerabilities and exploits in the SOC/Lab to keep skills sharp is a blast, and overall I don’t feel like working at Secure Sense is a job. I also get a thrill from seeing what we as a company are doing, and it’s exciting to know that I had even a minor role in the evolution of Secure Sense from a small 4 man consulting firm to the 30+ employee VAR/Consulting/Managed Services Provider that we are today. Ok, last one … it’s vacation time and you could be anywhere in the world right now, where would you be and why? Stay tuned next week for another edition of Secure Sense Crew Interview!